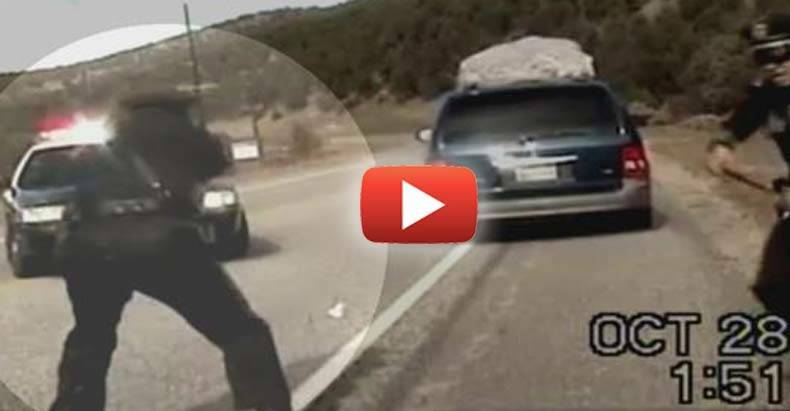 Video Shows this Cop Shoot at Minivan Full of Children, How is He Still a Cop? Taos County, NM — In 2013, a mother and her children feared for their lives when a stop for a speeding ticket turned into much more. Oriana Farrell, 39, of Memphis, was bringing her children across the country on a family road trip, when things took a turn for the worse. After Farrell had been given a citation, she decided to drive away from police. Several short chases then followed, before one of the cops, Elias Montoya, unloaded his pistol into the minivan as it drove off. Common sense prevailed, for a short time, and Montoya was fired from his job as a New Mexico State Trooper. However, he was just rehired with the Taos County Sheriff’s Department as a deputy. According to Taos Co, Sheriff Jerry Hogrefe, Montoya was chosen from 17 different applicants to fill just one of two available positions. Did the other sixteen applicants actually kill children? Is that why a person who shot at children was hired? Insidiously enough, after the incident got swept under the rug, the State Troopers actually tried to hire Montoya back, but he refused. Apparently Sheriff Hogrefe thinks that shooting at a van full of children is just fine and dandy and has stated that Montoya has a clean record. “Nothing from DPS [or] the training academy pertaining to his certification or qualifications…so he has a clean work history,” Hogrefe said. According KOB, the sheriff defended Montoya’s actions in the dash cam video, saying Montoya didn’t know there were kids in the van and that he believed the driver had a gun. “I cannot fault anyone for making a split-second decision,” Hogrefe said. According to Montoya’s new boss, shooting innocent until proven guilty people in the back as they flee is justifiable, as it was a “split-second decision.” Seems like Montoya will fit right in. Below is the raw video from the original incident.